Professional Lacrosse represents the pinacle of Lacrosse. There are two pro leagues. Both leagues have teams in both the US and Canada. Both leagues are very different in terms of the product they deliver, but what they both have in spades is super high quality fast and furiously paced action that truly delivers some of the finest the sport has to offer. The MLL (Major League Lacrosse) which is essentially field lacrosse the way it is played around the world with some cool variations. The NLL (National Lacrosse League) which is indoor lacrosse of the Canadian or Box Lacrosse type played on hockey rinks. Both leagues contain some of the very best lacrosse players in the world at any level. With relatively few pro teams and all of college and Canadian lacrosse talent to pick from the teams are stacked with true stars of the game doing what they do. It is truly breath taking smash mouth extremely fast non stop action. Pro lax is like many minor league professional sports that fight over our entertainment dollars. 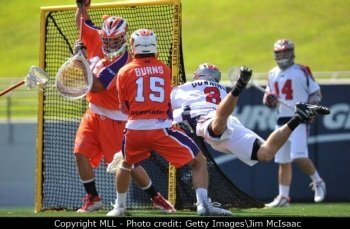 I can tell you from first hand experience that if you are looking for super fun high action entertainment then our pro lacrosse leagues are exactly what you are looking for. Grab the family or a couple buddies and dont throw away $25.00 a ticket at the local movie theater. If you are in range of a team go see a lacrosse game at a fraction of that price. Or better yet with season ticket packages for most teams starting well under a $100, and individual game seats around $10 you cant go wrong. Come join the fun. Support your team. And lets push this sport to the next level in terms of its popularity amongst the masses.